The Winnipeg Jets begin a three-game road trip tonight against the New Jersey Devils…The Jets split a pair of home games earlier this week, losing 4-3 to the Pittsburgh Penguins on Tuesday and defeating the Chicago Blackhawks 6-5 on Thursday…The Jets continue the road trip tomorrow night against the New York Rangers. The Jets have tallied 20 goals in their last three wins and have tallied at least six goals in each of the three games…The Jets are averaging 4.5 goals in games they win this season…Winnipeg’s 83 goals scored this season is tied for seventh in the NHL…The Jets are 10-0-1 this season when scoring four goals or more. Tonight and tomorrow marks the fourth of 10 back-to-back sets the Jets have this season…Winnipeg is 2-1-0 in the first game and 1-2-0 in the second game of back-to-backs this season…Last season, the Jets went 4-3-2 in the first game of back-to-backs and 4-4-1 in the second game…Nineteen of Winnipeg’s 20 games in back-to-back sets this season are on the road. The Jets are 5-4-1 against Eastern Conference teams this season, including 3-1-0 against the Metropolitan Division…Winnipeg went 19-7-6 against the Eastern Conference last season, including a 10-3-3 record versus the Atlantic Division and 9-4-3 record against the Metropolitan Division. 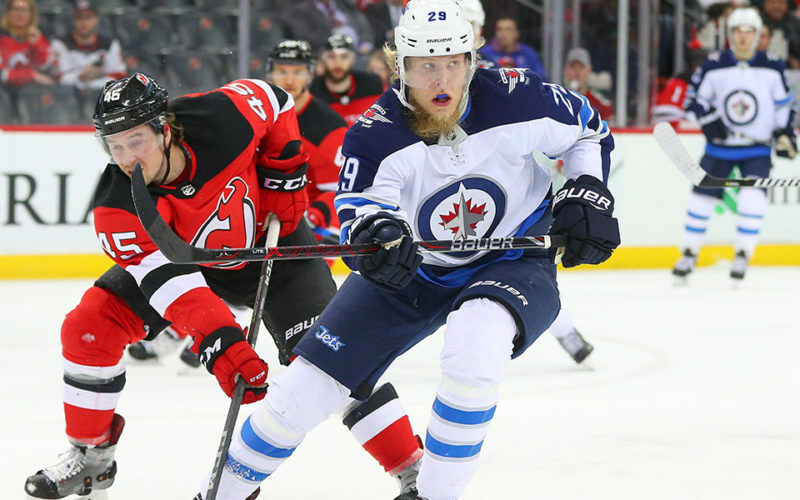 The Jets top line of Mark Scheifele (2G, 3A), Blake Wheeler (5A) and Nikolaj Ehlers (3G, 2A) have each posted multi-point games in back-to-back outings…Ehlers netted his third career hat trick in Thursday’s game against Chicago…Wheeler now has nine multi-point games this season, which leads the Jets and is tied for 10th in the NHL…Scheifele matched a career high with three assists on Thursday. Jets captain Blake Wheeler is tied for fourth in NHL scoring in November with 21 points (2G, 19A) in 12 games…He leads the NHL in assists with 19 this month and is second in points per game with 1.75…Patrik Laine racked up 18 goals in November, which leads the NHL and established a franchise record for most goals in a calendar month. Patrik Laine notched his 100th career goal on Thursday in his 179th career game…He’s the fastest player in franchise history to reach 100 goals…Laine is the 10th player to score 100 goals with the Jets franchise…He is one of only seven players in NHL history to score 100 goals before reaching the age of 21…At 21 years and 224 days of age, Laine is the fourth youngest player in NHL history to reach 100 goals. Patrik Laine became the first player in the NHL to score 20 goals this season…He leads the NHL with 21 goals this season…By doing it in 24 games, Laine matched a franchise record for the fewest amount of games needed to reach 20 goals in a season…He has scored 13 of his 21 goals this season in his last six games for an average of 2.16 goals per game.